Everyone in coffee knows that there are umpteen variables involved in producing high-quality specialty stuff, but not everybody knows how many variables also exist when it comes to sourcing and shipping the best green coffee around the world. Roasters and green-coffee buyers know all too well that between creating and maintaining blend recipes, roast profiles, farm visits, shipping and storage, inventory, and cost-benefit analysis, there’s plenty to keep in mind and consider in the warehouse—let alone around the world. 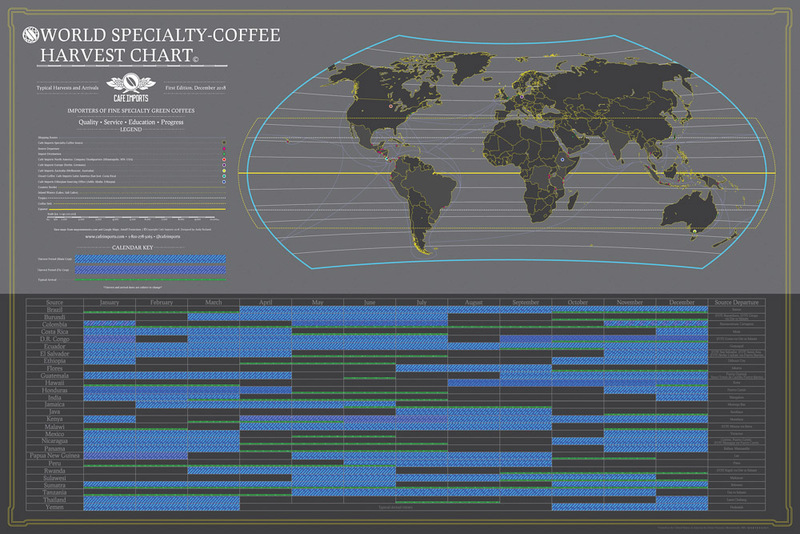 Naturally, every coffee on earth isn’t available at all times: Seasonality means that coffees have their time in the sun and their time in the warehouse, and navigating that schedule can be as complicated as writing café shift schedules. In an attempt to help our customers—and anyone else who’s interested in the turning of the coffee calendar—track what coffees are being picked, shipped, and potentially arriving at any time, Cafe Imports’ creative director Andy Reiland; international logistics coordinator Rachel Young; and the green-coffee-buying all-star team of Andrew Miller, Jason Long, Piero Cristiani, Luis Arocha, and Claudia Bellinzoni put their heads and datebooks together to create the World Specialty-Coffee Harvest Chart. 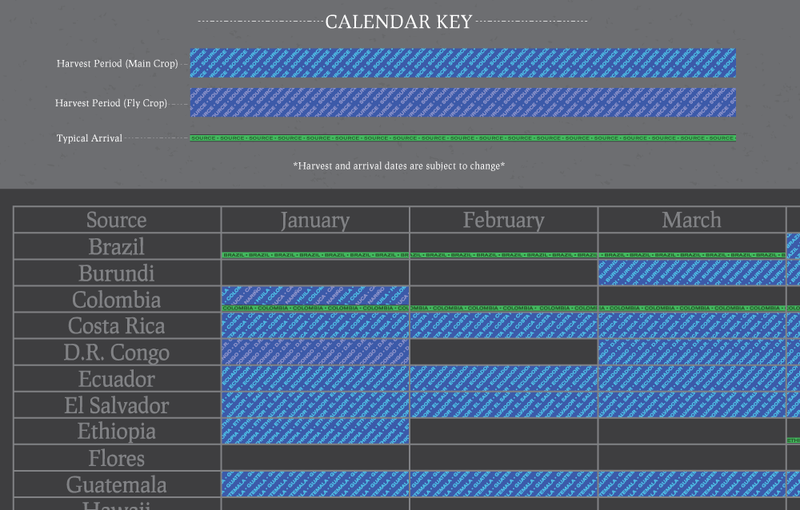 The chart features a year-round snapshot of the 28 coffee regions in which Cafe Imports works, complete with general harvest-season guidelines and estimated arrival times. Main crop and fly crop are marked in different colors, and regional variations are also noted where applicable, for instance in Colombia. (Of course, we coffee people also know that nothing in agriculture or global logistics is ever completely perfect, so your mileage—and dates—may vary slightly from year to year, but every attempt was made toward accuracy.) 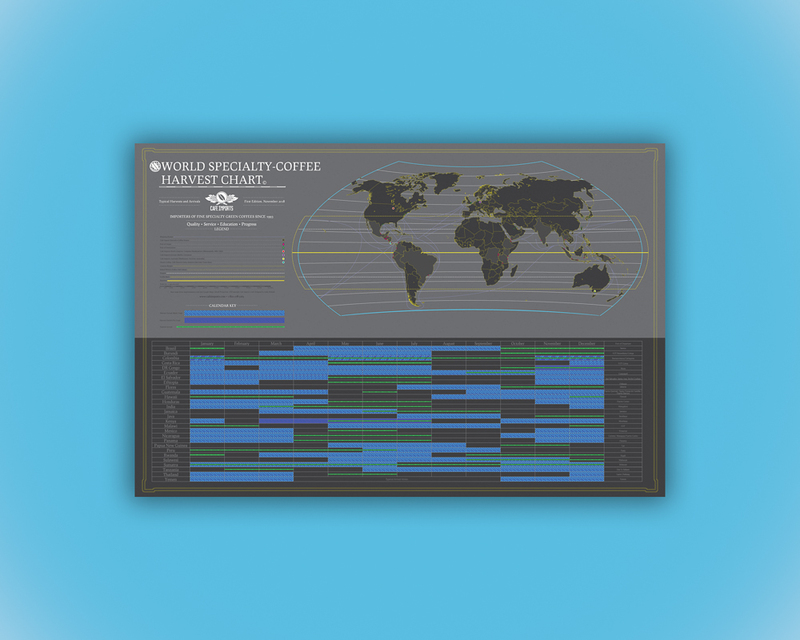 The chart also includes a shipping-route map to give roasters an idea where their coffee goes before it winds up in the drum or the cooling tray. Shipping ports, Cafe Imports offices, and import destinations are also featured, just for fun. Hopefully, you’ll be able to refer to this chart for your sourcing and roasting forecasts, blend planning, and general pursuit of increased coffee geekery. Along with the World Specialty-Coffee Maps and the Coffee Family Tree, your bases should be pretty covered—or at the very least your walls.